After multiple sold-out shows in 2018, Enfiniti Productions is bringing back the super-popular OlaBola the Musical for another run. This time, however, it will be “slicker, stronger, more luar biasa“. Fans, live-arts enthusiasts, and the generally curious will be happy to know that the Show Director, Tiara Jacquelina, promises a truckload of updates for the re-stage. “The re-opening of OlaBola the Musical is a MUCH improved version of the original. Since we have this opportunity, we decided to give the audience an even more powerful and unforgettable outing. Everything will go up several notches – music, lighting, football skills, and dance choreography – [just about] EVERYTHING! If you’ve watched last year’s show, then we hope this edition will blow you away as it is a re-experience of Olabola,” Jacquelina shared. As the first edition is famous for converting naysayers, it’s apt that the re-staging will create believers. After all, the inaugural setting is the critical re-invigoration for live-acts; so this second showing is setting out to be even more transformative. “First time around, it got the thumbs up from the media, art critics, and audiences who declare they’ve watched the show four to five times. For 2019, we’re set to top our personal bests and achieve a whole new standard for musical theatre. Our goal for OlaBola is to light the candle that will stand up [and challenge] any of the greatest musicals; [I daresay we want to compete with what] the world has to offer,” she added. 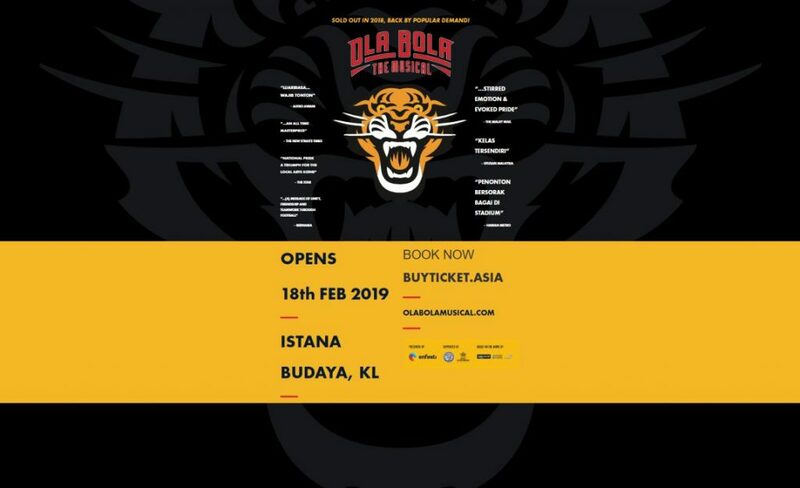 Tickets for OlaBola the Musical, which runs from 18 February 2019 till 3 March 2019, are on sale now. Just head over to at BUYTICKET.ASIA to get them now! As for those who want details about the upcoming show, just swing by here.